Silver prices have soared this year (see Figure 1), with the commodity overtaking its more famous relative, gold, as a dynamic investment. The precious metal’s recent turn in fortune comes on the back of heightened investor demand, and because of its application as an industrial material. Although gold’s rise has been well documented in recent times, with it hitting unprecedented price highs, silver has not garnered quite the same level of attention. However, gold’s poorer cousin has many of the same qualities, and a few that are unique, making it an increasingly attractive investment option. The preservation of wealth will always be the overriding factor for supporting the price of silver and, as the US dollar continues to fall, the fear of rising inflation, the possibility of further economic and financial shocks, the widespread assumption of further loose monetary policy and additional quantitative easing are all factors pushing the price of silver to levels not seen since 1980. The other dynamic of the silver market is its industrial applications. Silver is used in everything from photography and electronics to solar panels and even clothing. It is also used as a catalyst for soldering or welding in the manufacture of batteries and mirrors, among others. Jewellery and coins are also key products using silver. As emerging markets around the world begin to play a more significant role in the consumption of physical silver in coming years, as their economies continue to maintain solid growth particularly in manufacturing, it is likely that demand for silver as a key component of certain products, particularly electronics, will continue to rise. For the last 20 years the average price of silver has remained so low that investment demand has been almost non-existent. With the price of gold recently exceeding $1,350 an ounce, investors are looking for cheaper alternatives and silver has been the major benefactor. 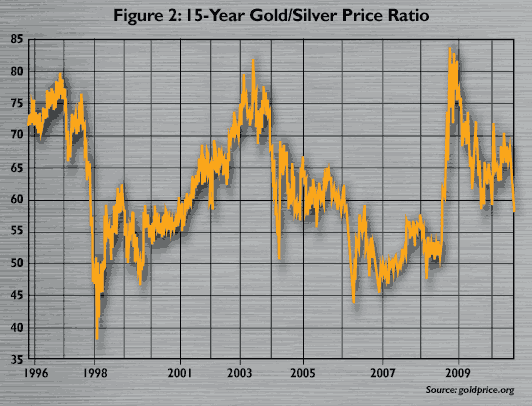 This is shown in the popular gold/silver price ratio (see Figure 2), which indicates how many more times expensive gold is to silver, which has widened to as much as 78 in the past two years, but currently stands at about 60. As the price of precious metals in general continues to increase, silver often becomes the only metal that some investors can afford to purchase, again taking investor demand away from gold and into silver. Another dynamic of the rising price of silver is the demand for physical delivery from investors who are particularly concerned about the health of the financial system in general or more specifically the health of the banks from which many investors buy their bullion. It has become much more practical to store this bullion, and many investors have been demanding home delivery, putting further stress on available supplies, which are shrinking rapidly. If you also add the phenomenal rise in the open interest of silver Exchange Traded Funds over the past year, and with more coming to market soon, the pressure on already limited supplies looks set to increase. Another rarely reported aspect of the silver market is the alleged manipulation of prices over the past 20 years by big institutions, which may have kept prices artificially low. The introduction of the Volcker Rule in early 2010, which restricts US banks from certain types of speculative activity that are not directly linked to customers, have forced many of the larger institutions to close their proprietary trading desks. Whether the alleged manipulation is proven, or prosecuted, or not, the fact remains that the removal of these large players from the market coincided with the recent 20 per cent rise in the price of silver. 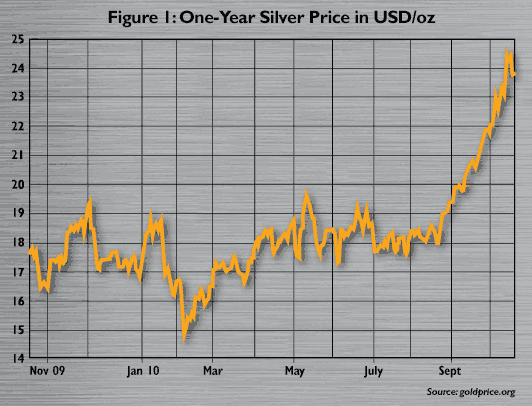 Silver prices have the potential to move a lot higher from current levels over the next year to 18 months. In this timeframe gold has the potential to move as high as $1,800-$2,000 per ounce and, if you follow our reasoning that the gold/silver ratio can fall to as low as 30, we could be seeing silver prices making all time highs of $60-$70 per ounce, meaning silver may not be referred to as the poor man’s gold for very much longer. 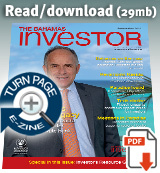 The views expressed in this article are those of the author and not necessarily those of The Bahamas Investor. Global mine production rose by almost four per cent in 2009, its seventh straight annual increase, to reach a record high of 709.6 million ounces. Warren Roberts is the founder and managing director of Berkeley (Bahamas) Ltd, a broker/dealer established in 1999. He has over 23 years experience in trading commodities having previously been based in London where he worked at both MeesPierson Derivatives Ltd and ADM Investor Services.